The Colour Purple - worn with pride. The word 'purple' comes from the Old English word purpul which derives from Latin purpura, in turn from the Greek πορφύρα (porphura),. For centuries, the purple dye trade was centred in the ancient Phoenician city of Tyre in modern day Lebanon. The Phoenicians' “Tyrian purple” came from a species of sea snail now known as Bolinus Brandaris, and it was so exceedingly rare that it became worth its weight in gold. 9,000 molluscs were needed to produce just one gram. Roman Emperors chose to wear purple to reflect their power and the wealth of the Roman Empire. The colour was worn by rulers throughout the ancient world but also became associated with spiritual and religious leaders. Famously Queen Elizabeth I refused to allow anyone outside the royal family to wear it. Sumptuary laws during her reign regulated and restricted the colours and fabrics that could be worn by the different English classes. Purple attained regal status and it was not until the mid-1th century that a scientist experimenting to find an anti-malarial drug found a synthetic way to make the colour that it came into popular use. All this brings me seamlessly to my own connection to the colour purple. 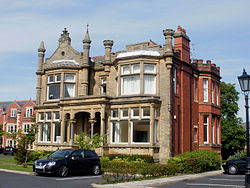 I attended Elmslie Girls’ Independent Grammar School here in Blackpool, founded by two sisters named Brodie and sited on Whitegate Drive in a substantial double-fronted detached house. The school grounds were filled with Elm tree (hence the school’s name) and also abundant with crocus every spring, from which came the splendid purple and gold of the school uniform. Attending an all girl’s school had its ups and downs. The atmosphere was great. Sports were very competitive and many students excelled in music, sciences and the arts. I hazard a guess that this was probably due to a lack of distractions by boys but it was also due to a great sense of camaraderie and identity. The uniform was distinctive. A deep purple blazer, trimmed with gold braid and a brimmed, purple felt hat with a taffeta band adorned with a fabulous enamelled badge bearing the Red Rose of Lancashire and the crossed keys of St Peter, topped with the bishop’s mitre. I really wish that I still had by hat badge. If anyone has a spare please feel free to contact me. On the downside, we Elmslie girls were affectionately called, The Purple Virgins. Needless to say that I have no comment to make on that score. I know what I know and I promise ladies my lips are sealed. We have a code of honour. We have a school song with a Latin motto. Attending Elmslie was a little like being a student at Hogwarts. We had our secret passageways, spooky staircase and archaic sick bay too. I am proud to have been an Elmslie girl and loved wearing my purple regalia. It carried a certain kudos and on through my lifetime it has opened a few select doors. I am still in touch with many of my school friends and as 2018 would have been the school’s centenary, (sadly it closed over a decade ago and the building has been converted into luxury apartments), we are celebrating with a weekend of events in May. Hundreds of former purple virgins will be gathering in Blackpool in the spirit of friendship and reunion that we sang in the school song so many years ago. Eat your heart out J K Rowling. To be grateful is our rule. Stand our much loved Elmslie School. Battles are both lost and won. Happy when the task is done. And old friendships we’ll renew. "It matters much more what a girl is than what she does, and if you have learnt to work hard, play hard, keep faith, forget self, help others, you will have begun to be, in the highest sense of the word, a useful member of society. I would remind you of the famous words, "To labour and to love is the sum of living". Most instructive Adele. There's no denying how much our school days shape us. Purple has always been my favourite shade of virgin, by the way. I guess good Queen Bess can lay claim to being pre-eminent there. A good maxim: 'To labour and to love is the sum of living'. Elizabeth Brodie - any relation to Miss Jean Brodie? Was Muriel Spark an Elsmslie girl? I think that Jean Brodie was ficticious. Three Brodie sisters founded Elmslie. I don't recall Muriel Sparks but Paula Yates was a pupil when I was there.